There’s just about a month to go before students in the Menlo Park City School District return from summer break. And from the looks of the Laurel and Encinal campuses this morning, plenty of work is still to be completed before students can be welcomed back there. 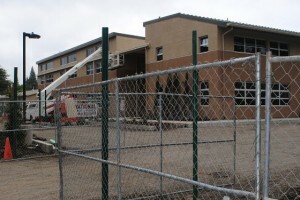 At Laurel, pictured above, the area that once housed portable classrooms and the second-grade playground has become a bustling construction zone. While the new third-grade building, barely visible in the background of the photo, is just about complete, the new playground and soccer field have yet to take shape. On the other side of campus, the Kindergarten playground is also being torn up and replaced. The outdoor improvements are scheduled to be fully completed in November. For an overview and more photos of all of the site improvements, see the Laurel Website. Over at Encinal, things are closer to being finished. Work on sidewalks and other hardscape were underway this morning — creating a street closure on Encinal Avenue from Middlefield to Laurel Street. At least the new fifth-grade building (at left), which was originally scheduled to open in the spring, is ready for school’s start. For more on the construction, including photos, see the Encinal Website.